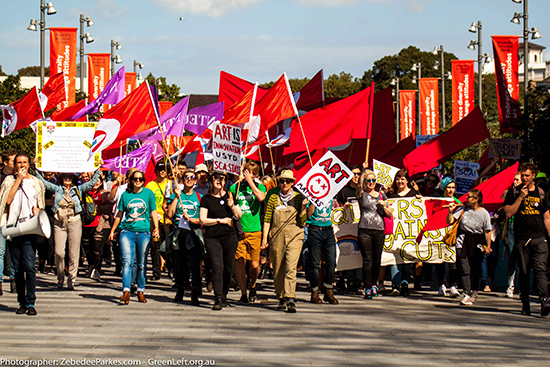 Sydney College of the Arts is fighting for its future. Dedicated, articulate and formidable students currently occupying the Dean’s Office in the Callan Park campus have faith in their education and in the history and significance of this institution; and they are supported by alumni, artists and communities who recognise the value of both SCA and visual art education to our culture. It is a much bigger issue than the future of a single art school. This is an important fight, and potentially a turning point for culture in Australia. 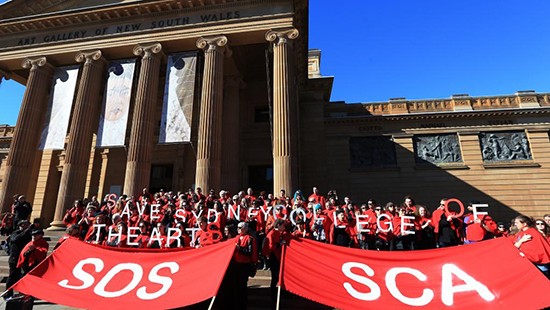 The protest is a defense of the integrity not only of SCA, but all other Australian art and design institutions, including increasingly beleaguered TAFE college departments. The NSW Government’s land grab for Callan Park, the SCA site, and the old Darlinghurst Gaol, home to the National Art School—shifting the classification of both from education to property—and the devaluing of art education are not isolated events, but symptoms of a concerted undermining of art and culture more generally. This insidious push towards privatisation comes at the same time as arts sector funding cuts have devastated small to medium arts organisations and those funds diverted to pork barrelling by Arts Minister Senator Mitch Fifield—arts spending without transparency, consistency or expertise. At the same time we see, more broadly, a profound erosion of civil liberties, including our rights to protest and to privacy. Thus far, the proposed closure of SCA by merger with UNSW Art and Design has been effectively prevented, but under the University of Sydney’s strategic plan, released last year, SCA is slated to be absorbed into the massive Faculty of Arts and Social Sciences, ostensibly to reduce bottom line costs, including devastating cuts to staff numbers. 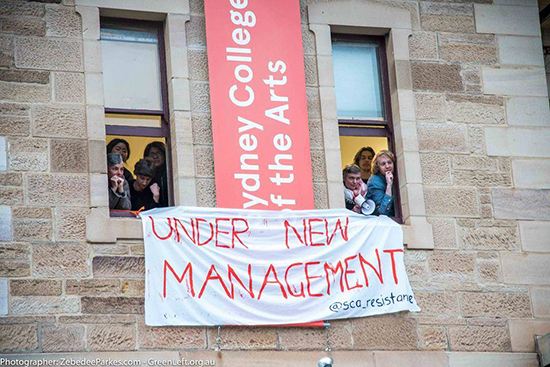 Moving SCA to the main campus of the University of Sydney could easily result in slow death by asphyxiation: in other words a continuation of the current management strategy that has overseen, rather than countered, falling enrolments at SCA. The numbers of those enrolling in creative tertiary education had slowed markedly 2008-2013 (The Arts Nation: an overview of Australian arts, 2015 Edition Australia Council, p16). This legitimises as much as creates the short-term economic arguments for closing art schools. To lose a proposed 60% of SCA staff, whole departments and important equipment and space is an attempt to fit art education into a philosophical and economic model that smacks of the dumbing down and anti-intellectualism that has pervaded commercialised and privatised education internationally for at least a decade, particularly in the US and UK. Forcing art schools into conventional learning environments cannot but reduce the efficacy of teaching and learning. If you lack the resources of space, time and equipment you cannot effectively and expansively engage in the creative process, the limitations of the environment curtailing what you imagine as possible in your practice. In the last five to 10 years, the UK has implemented a particular kind of austerity politics that has had profound effects: funding cuts, fee deregulation and short-term economic models of governance have placed even the most renowned art schools under duress. The push to sell off grounds and incorporate art schools into other campuses has also been underway for some time. The Sir John Cass Faculty of Art, Architecture and Design at London Metropolitan University effectively resisted this process until February this year, when the property was sold for £50 million and leased back to the university until the faculty moves to the university in 2017. Part of this cultural shift has meant that art and design universities in the UK have increased their fees to £9,000 a year (and are looking at deregulating further), directly pricing out students from poorer backgrounds, but also likely deterring women, mature age, CALD and LGBT students, and those with disabilities, for whom the financial burdens seem a significant risk. Enrolments are reduced, in effect reducing the vibrancy and diversity of creative voices, debate and, in the long term, cultural breadth and depth. Education becomes the privilege of those with significant funds. My former students are now graduates with fee debts of around £60,000 and loans. The threat of $100,000 degrees in Australia is already both a cultural and economic reality elsewhere. The real deception here is the notion that knowledge and learning have definable monetary value, and that such value is predictable and tied to current ideas of employability. Similarly, in UK further education colleges and schools, the availability of art and design study is now up for debate, as new models of assessment and evaluation of learning exclude creative subjects from essential study by prioritising instead so-called STEM subjects: science, technology, engineering and mathematics. This year’s art and design enrolments at GCSE level (General Certificate of Secondary Education, year 10) have declined 6%. This is not because young people don’t want to pursue creative subjects, but because access to them is being restricted by political and economic agendas [See the NAVA letter to Education Minister Senator Simon Birmingham. Eds]. Of course this is not the only model of education on offer. If Sydney University had included art and design education expertise in developing a strategy for the future of SCA, we might even have seen a University of the Arts emerge comparable to the University of the Arts, London, which has preserved the rich, independent cultures of its constituent art and design schools while streamlining administrative functions. Beyond UAL, London has many significant art schools, further testament that no international city should have only one art and design centre of excellence. It is, rather, an essential characteristic of creative education—and an outward-looking international city—that the range of institutions and cultures should be diverse. Perhaps politicians think artists are an easy target—powerless, politically naïve, unlikely or unable to fight back. Perhaps that’s what University of Sydney Deputy Vice Chancellor Stephen Garton anticipated when he agreed to meet with very determined SCA students on 29 July. Universities should take note of the possible consequences of the hasty and ill-conceived implementation of their short-term economic agendas. UK Labour leadership has placed arts education at the centre of debate, proposing the reversal of funding cuts to the arts and the reduction of university fees, pledging to introduce a pupil premium for creative education [as established for sport in 2013] as central to its arts policy and political platform. We should learn from this reversal of the current approach to cultural education before we lose the expertise and resources that will prove so hard to replace: we must go straight to championing creative education in Australia.